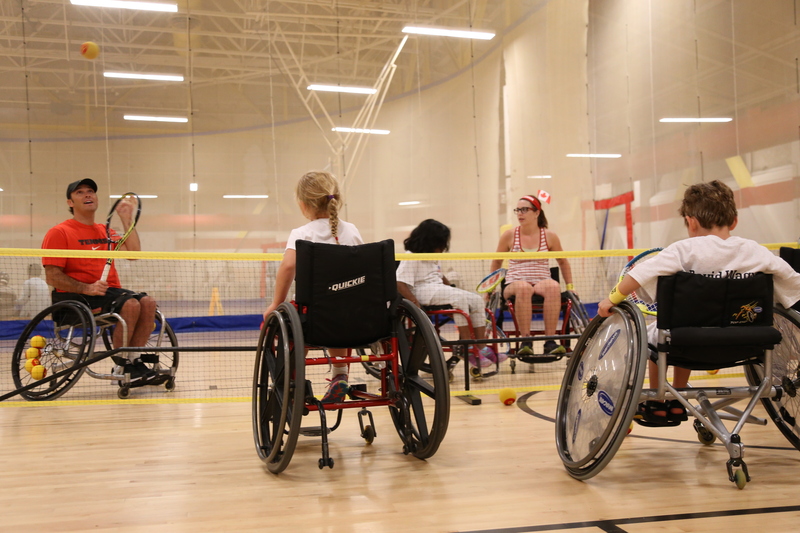 As a way to celebrate the Parapan Am Games taking place in Canada from August 7-15, 2015, the U.S. Consulate General Toronto programmed wheelchair tennis star David Wagner as a Sports Envoy to teach youth with disabilities the art of playing wheelchair tennis. Paralyzed from the mid-chest down with only 30 percent mobility in his hands, David Wagner is ranked as the #1 quad tennis player in the world. David has and continues to compete at the international level, including in three Paralympics and is training to play in the Paralympics for Rio 2016. On August 7-8, David touched the lives of more than 150 youth in wheelchair tennis clinics in collaboration with KidsAbility. David spent the day teaching clinics that included wheelchair mobility drills as well as ball passing activities. During the morning events, David was also the lead torch bearer for the 2015 Toronto Parapan Am Games Torch, lapping the indoor track carrying the torch in front of hundreds of people as one of four stops that day before the opening ceremonies of the Parapan Am Games. Among the high profile guests that attended the clinics and torch relay included U.S. Ambassador to Canada Bruce Heyman and U.S. Consul General Jim Dickmeyer. The following day, David gave a presentation, which included photos of his life from able-bodied to gold medal winning paraplegic tennis player. Assisted by wheelchair tennis player Cyndy McLean and several local tennis coaches, David then followed with a series of skill building clinics. Following the clinics, David hosted a coach’s program where he taught attendees how to train their disabled students as well as understand the increased benefits of wheelchair sports.